I’ve always had an interest in 1xAAA flashlights. Many years ago I had one of the first incandescent Maglite Solitaire lights, which had a pathetic output equal to about a single candle. They’ve come a long way even in the last couple years, and people I meet are continually amazed at the output and features of these lights. 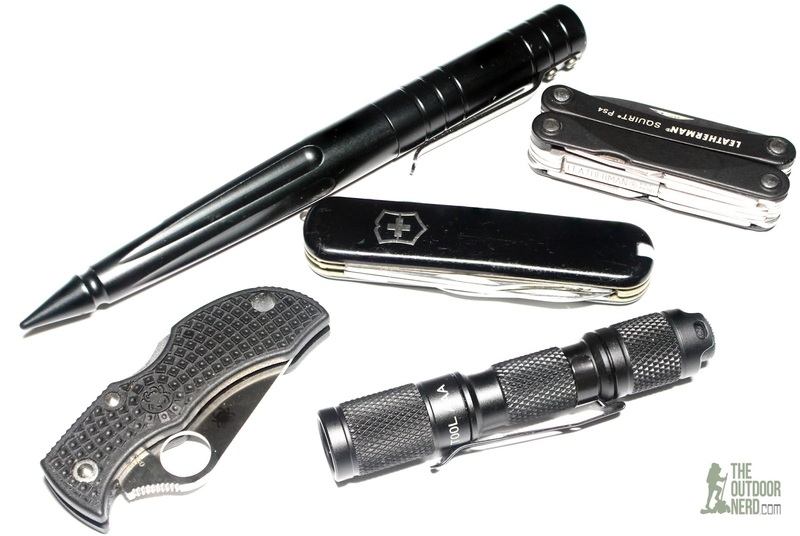 This is a 1xAAA “clicky” flashlight with a Cree XP-G2 and a snap on clip suitable for every day carry (EDC). It’s got a reverse switch just like you would expect, and interestingly, a scalloped tail with lanyard holes. Wow, it looks well done at first glance. The fit and finish look perfect. Of course, I don’t like the snap on type clips, which this model has. I also prefer clips to ride deeper on my EDC gear. But if I have an issue with that part of the design, the execution looks near perfect. And the clip is on tight at least. I don’t have a very good record with snap on clips, since the best outcome is usually that the clip ends up somewhere out in the world and the flashlight ends up at the bottom of my pocket. Putting an Eneloop AAA in the unit, I could see the other issue I was going to have with this light: It has fairly low frequency PWM which I can see on low with my eyeballs. It’s on the high end of low–higher than the MT06 I didn’t like, but it’s still something I don’t like. All things considered, this sample made a very good first impression with me. The quality of my review sample is better than average. 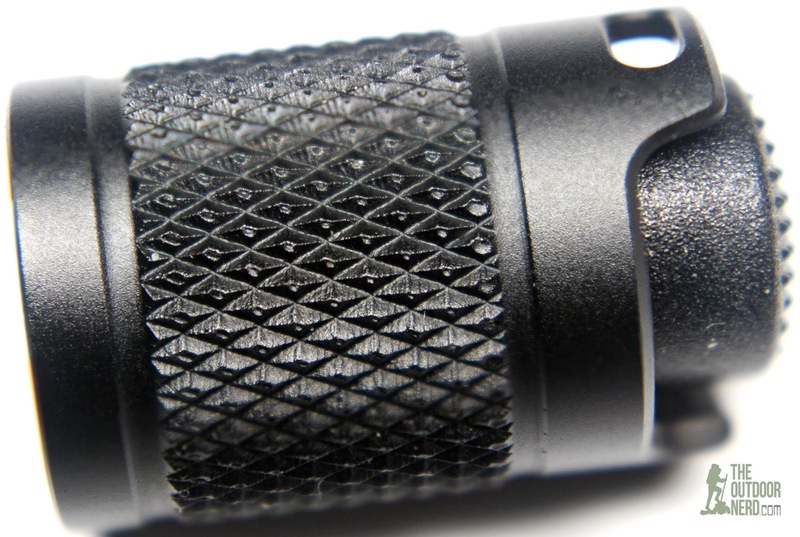 It’s well machined and the sharp knurling is well done. The scalloped tail looks like a more expensive light, and the clip is even anodized. The short-throw “reverse clicky” tail switch has a very good feel to it. There’s just no good way of predicting the number of cycles that a switch has before it goes belly-up, but it seems like the ones with a better feel are better switches. Overall, perfect. One of the photos shows what could be an artifact in the reflector, but I can’t see it with my eyeballs, even with a magnifying glass, and I can’t see it in the beam pattern, so I can’t really deduct points for it. 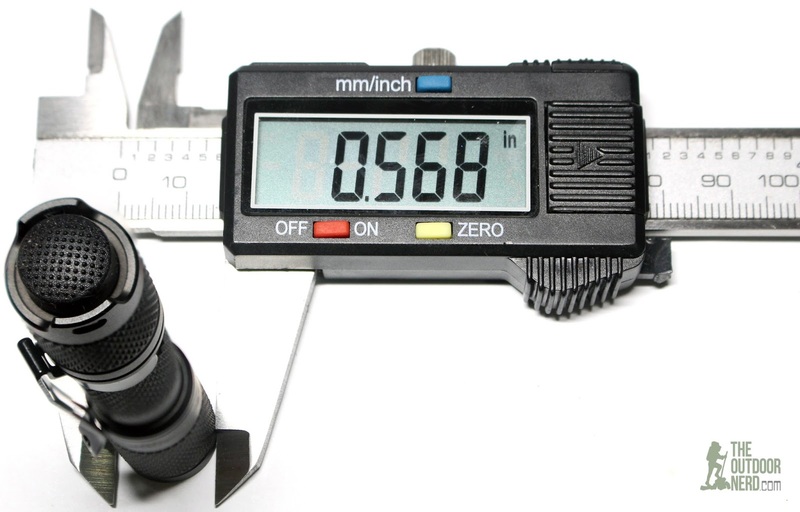 The emitter is perfectly centered, the triangular cut threads are well machined and anodized and there’s no nicks, blemishes, tool marks, scratches or anything else to find fault with. Threads are well lubed and o-rings look fine. 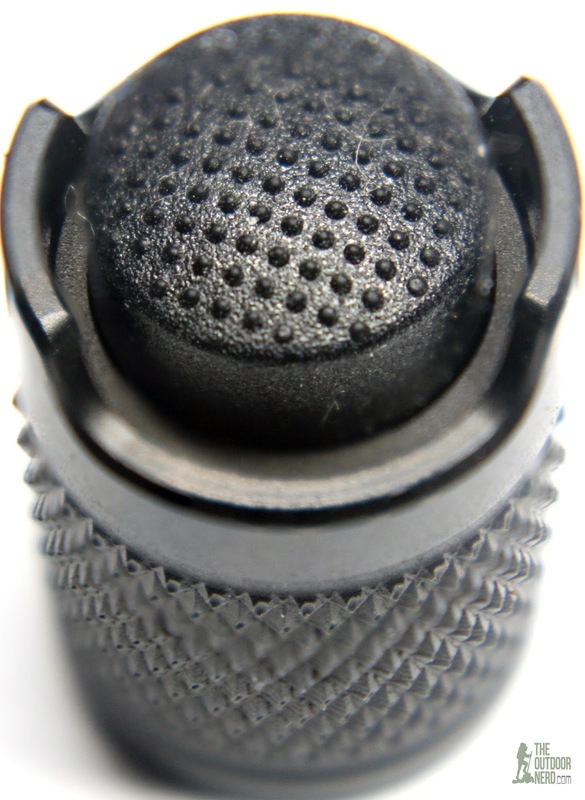 Overall machining looks perfect, including the sharp, diamond-cut knurling. Even the clip is unblemished. Bravo, Lumintop–good day to you. A reverse clicky tail switch is pretty much standard. Forward switches are my preference but they make it awkward to switch modes, so a reverse switch is simple and has a good, intuitive feel for most people. The only thing remarkable about the tail switch on the Tool is that it has what I consider an almost ideal feel for this type of switch. Time will tell how it holds up to my abuse. If it’s the ideal switch type for this type of light, then it’s also the most likely thing to fail in my experience. I don’t think they make lights this small with high-cycle electronic switches. This one is replacing the Ti3 I had in my EDC bag. It’s a fine backup, but I really like the switch on this one, and the fact that it can be clipped to a ball cap as an emergency headlight. This model uses PWM on low and medium, with high looking like it’s regulated constant current. My eyes barely notice it, but they notice it. Like I said above, it’s on the high end of low frequency, but I still wish they would bump it up if they were using it for the tint. The Tool uses an interesting Medium / Low / High mode order, with no mode memory. I personally prefer Low / Medium / High mode orders with no memory, with no mode-order preference if there is a memory. But this is one of the few areas of EDC flashlights where it’s like arguing religion, and there are many, many opinions on the subject. 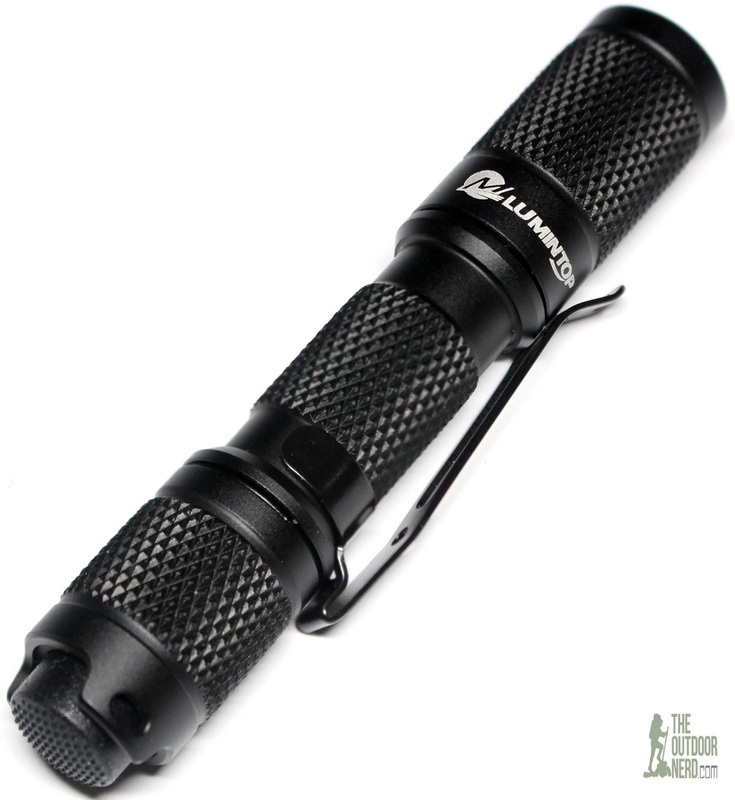 Changing modes is typical for this style of light with a reverse clicky tail switch: Full click for on/off and a half click to change modes when the flashlight is powered on. 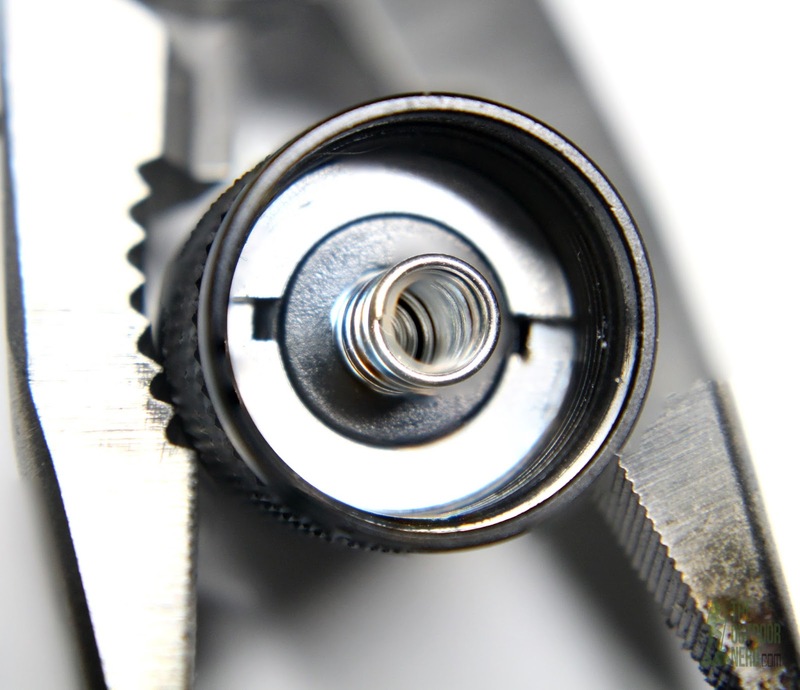 The Tool uses a Cree XP-G2 LED emitter. There’s no way a single AAA can power an emitter like this anywhere near its maximum output, but it’s still very efficient, and puts the output limitation on the battery, where it should be. The tint on my unit is fairly pleasing. It leans towards neutral white, and I can’t see any hint of blue or green that bugs me on other models. They did a good job with the tint. The only purer white tint below is the Ti3. The Tool only has the slightest hint of blue-ness. This model has a textured, “orange peel” style reflector. It’s pretty shallow, as it should be. The lens has an anti-reflective coating, and gives the tool a smooth, floody beam. There looks like a small blemish or crack in mine, but it could just be a trick of the lighting. The beam is pure flood, as it would have to be with an emitter this big in a reflector this small. It’s almost perfect for EDC, which is why I like small lights with an XP-G2 in them. The textured reflector makes for a smooth beam. I don’t have the equipment to measure output, but Lumintop’s claims look reasonable to my eye, and by comparison to other lights. The snap on style clip looks reversible, which is odd, because the body of the flashlight itself looks to be reversible as well. So any way you look at it, the clip is reversible. Reversible clips are a nice touch with lights like this because they work as a backup headlamp if you have a ball cap to clip them to. I do not like this style of clip, but at least it looks tight enough to where it wouldn’t easily fall off like my *cough* Ti3. But I have carried this light clipped to my pocket where I can at least say semi-confidently that it’s tight enough not to worry about under normal conditions. Of course, a clip that’s as tight as it’s supposed to be is going to rub on the body, scratching that good anodizing off. While it’s a deal breaker for a “shelf queen” that has to sit there not decreasing in value, it’s normal for a “user” but still makes me a sad panda to see that anodizing scratch. For hard use, I don’t personally trust any non-mounted clips. But it’s certainly good enough for my EDC bag as a backup. NOTE: All run times and current tests done with a Panasonic Eneloop Pro AAA battery. Low – 30 Not run. Medium 246 280 Lost regulation at about 3 1/2 hour mark. High 80 910 Lost regulation at about the hour mark. Lately I’ve been a fan of 2xAAA flashlights, but traditionally I’ve liked to keep it simple, and that means one cell lights light this. It’s a very good EDC form factor. Not the only good EDC form, but a very good one. 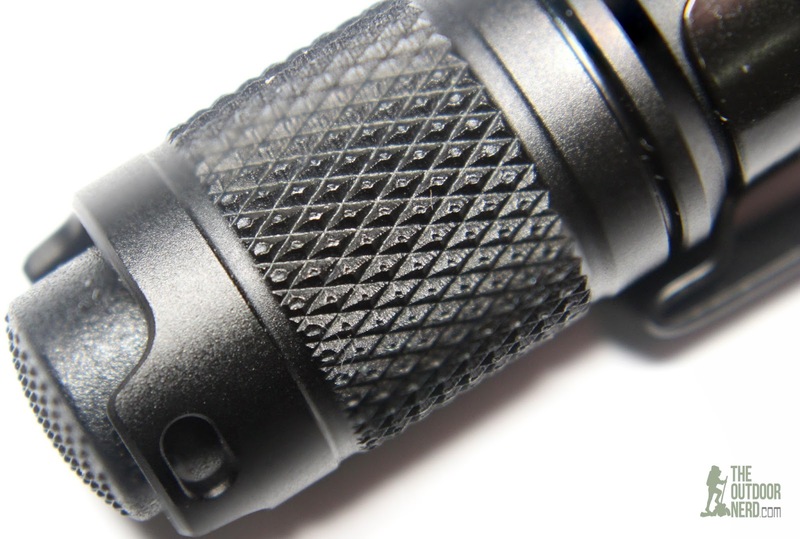 The good knurling with a good-feeling switch makes using this light a good experience day to day. It sticks a little farther out of my pocket than I would like, but it’s not a deal breaker. There’s just not that many companies making what I consider an ideal clip, so I’m used to the disappointment. This model will not tail stand. BOOOOO. They could’ve made that scalloped tail a little longer to made it tail stand. That’s why some of the bigger “tactical” lights use that style of tail in the first place. The scallops make it easier to click an inset switch. It’s light at 1 ounce even with a Panasonic Eneloop Pro AAA cell in it. With a slightly better driver and a mounted clip, this would be the ultimate small carry EDC flashlight. It’s not going to replace my Thrunite Ti4, with its deep carry clip and a creamy, perfect tint for my EDC, but it’s fine as a backup to it, and many people will find this model to be the perfect EDC. 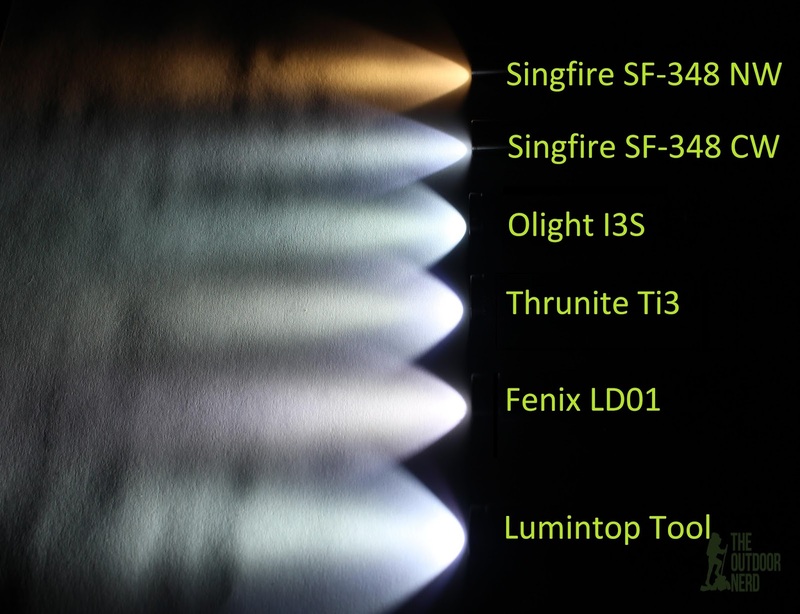 Certainly Lumintop knows what it’s doing with the 1xAAA form factor. If you are not super hard on your clips, and your eyes aren’t bothered by PWM, then this could be your perfect EDC. The output on high is fantastic for a 1xAAA light. The good output, with the good tint and floody beam makes this a pleasant experience pointing this thing into a dark area–at least on high where I can’t see the PWM. The Ti3 head fits on my Lumintop, so maybe that will make a better combination?